That's the firm opinion of not-so-meek minister's daughter Lavinia Ellison. So even though all the other villagers of St. Hampton Heath are swooning over the newly returned seventh Earl of Hawkesbury, she is not impressed. If a man won't take his responsibilities seriously and help those who are supposed to be able to depend on him, he deserves no respect from her. In Lavinia's pretty, gray eyes, Nicholas Stamford is just as arrogant and reckless as his brother--who stole the most important person in Livvie's world. Lately, I've found my not so interested in Historical romance books, & because of that, I was worried I wouldn't want to read this book, but to my surprise, I really enjoyed this book. 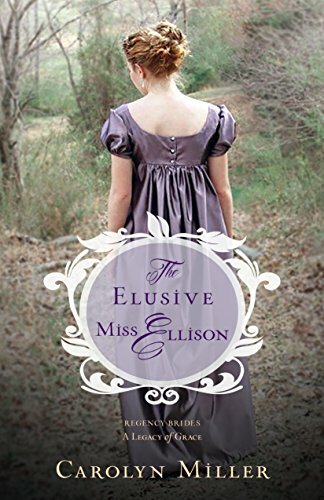 "The Elusive Miss Ellison" written by Carolyn Miller is set in 19th Century England. I'll be honest, though the pace of the book was slow in some parts of the book, but I was able to push through them. I don't want to spoil the book for others so I won't go into details about what happens in the book, but I will tell you that there is a twist in this book that I wasn't prepared for.